The day of Sterling Hts. we spent much of the day lazing around and napping. The weather was been brutal out there, around 90 or hotter each day. We started to re-motivate around 3:30, got some food, had a beer and got on the road to Bob around 5 with friend Candace and Captain Steve at the helm. There was really bad traffic on the way to Sterling Hts. so Jimmie Vaughn was already on when we got there. Jimmie saw us right off though and waved with a huge grin on his face. It’s really too bad we’re not going to be seeing him more this tour. The layout of the venue was actually pretty good. Our seats had good sight lines despite being quite a few rows back. I love the first show we’re back because I always feel like I’m at home after a long trip away. As soon as Jimmie was over it was a constant line of people by to say hi to and exchange hugs with…giving everyone the rundown of where we’ll be…making plans for days off… Steve and Candace scored the seats right behind us since no one came for them which was good cause we were standing and dancing the whole time. Usually we get told to sit down at least once, but everyone was coming by to tell us how great we were that night. Bob played the first 5 on guitar, which we hadn’t witnessed yet. It all started off with a Humboldt country fave, RDW 12&35. It was fun seeing him up front again with the guitar strapped on. As soon as he stepped behind the keyboard he smiled and gave a jazzhand as people cheered and some danced. It was a pretty mellow crowd so the few that were stood out even more than usual dancing around like crazy people and I think Bob really appreciated it. He has rearranged a number of songs in the past few months, most of note the Modern Times Songs, all of which sounded great. Bob Segar was a couple rows ahead of us. It was our first Spirit on the Water and The Levee's Gonna Break and I love the new It’s Alright Ma too! It Ain’t Me, Babe always reminds me of when I first started seeing a lot of shows. It was a fun time full of change in my life so that makes me happy. It was really great to talk to everyone and luckily the weather broke yesterday so it wasn’t so bloody hot. It was just right and I felt a real sense of euphoria dancing there with the breeze blowing my hair. Steve was the DD and got us home safely. We all noshed on the leftovers and jumped into the hot tub smilin’. Before Toledo we hooked up with a friend. All the other people we hadn’t seen in Sterling Hts. came to say hey and have a closer look at my hair which caused more of a stir than I thought it would. Our seats were off to the left in row 4 which was just fine. We were the only ones dancing for Jimmie Vaughn, but by the time Bob took the stage everyone was on their feet. I looked over to my right at one point and saw my best Bob friend from home in Athens sitting there so I got to talk to him and his friend for a while during the break and that made me really happy since I didn’t know he’d be there. We were able to stand up on the rail for most of the show with plenty of dancing room. Cat’s in the Well was the first song, but the real thrill came in slot 2. Bob played When I Paint My Masterpiece for the first time since Las Vegas ‘02. Bob was totally determined to stoke everyone up and he was hilarious! Other rarities included Floater, which he hadn’t played since Dublin ‘05, another fine show we happened to be attending. Bob thanked the crowd and told one of his typical jokes. “George Recelli is on Drums. Speaking of zoos, George has his dog on tour. We call him a real hound for music.” After the show we said our temporary goodbyes to everyone and listened to Alice Cooper’s surprisingly good radio show on the hour drive back to Ann Arbor. Yet again we snacked on Grilled Cheese and hit the hot tub to soothe our aching bodies. After a somewhat grueling journey back home which included a trans American flight and five hours of overnight driving, we landed safely home. Our house has been under construction and I was awoken around 10:30 AM after only a couple hours of sleep. With no where to escape I decided I’d better get up and get my packing started anyway since we were heading out that evening again. After a night’s stop in Reno and another somewhere in rural Utah we found ourselves in Colorado in the summertime once again. Not a minute too soon either as I needed to attend to the aftermath of a nasty encounter that involved my nose, nose ring and some pliers. My nose was the loser of the match. Colorado is one of the greatest places to be in the summer and it didn’t disappoint this time again. We headed out for a little drinking with a friend, which turned into too much drinking and made it hard to get up as early as we wanted to in order to get in line. We got there before the sun peaked his head up from the east and joined a nice couple who’d camped out after the Incubus show the night before for the long wait. It was one of the rougher days in line. First let me say that Red Rocks is one of the coolest places I’ve seen a show. Telluride was also up there-but that’s next. Red Rocks is really cool-but there are A LOT of stairs to the front of the line. When you’re from sea level each step is harder. I’m not in the best of shape, but we do make our way up some mountains out here in California, and should I have been supplied with the proper oxygen I’m positive it would have been easier. This in mind we only made 2 trips up and down that day-once to eat and once to change for the show. By the time our friends working at the top of the stairs waved us on up we were pretty well rested and we leaped stairs at a time upward and ran, then scooted down the front “non-handicapped” GA row with all our pals. I put that in quotes because you can apparently buy those tickets no matter who you are, but that was no matter. 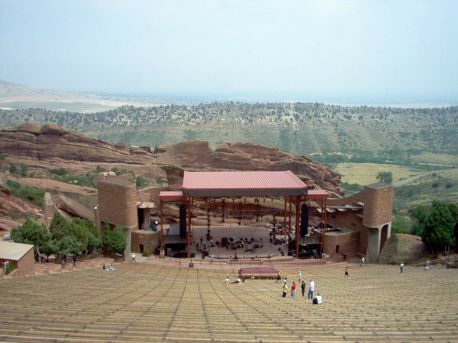 Every seat really is good at Red Rocks and the setting is more than anyone can ever dream of, breathtaking and beautiful. The skies had been threatening for awhile and there were a few showers as My Morning Jacket opened. We saw them back when they opened for Bob in Louisville in 2003. The band members that remain from those days look about the same and they sounded ok. It’s had to give any band credence when you’re just waiting for Bob, but there not the worst opener I’ve seen. Red Rocks was sure to bring some surprises and magic. We saw our second and the last Masterpiece of the tour. I’ve been thinking about this song a lot in the past year, so it was nice to see it back around and I love the way Bob says “Brussels“. Every Grain was ethereal in the setting among the Rocks. Friend of the Devil was the real kicker of course. I think I went into a state of disbelief for a minute and then thought about the Eugene Show where I saw Bob do it last and remembered I’d experienced the same thing there. It was beautiful and perfectly captured the evening as I thought back to our route through Reno and across Utah…I had to smile! Another fave of mine from that night was Shooting Star. I always love the way Bob plays it and his tender singing it so well suited to it. After the show we slowly made our way out and headed back to the hotel to talk to friends about how awesome it was…and ended up too late again making it very difficult to arise for the next day of line. After I remembered how great the night before was I got it together though and we made it there in one piece. We had a bit more energy to go out and do stuff that day, but I made my best effort to rest under our tarp construction and conserve it for the long drive ahead to Telluride that night. We got a great spot again next to a cool guy from Florida named Tim. He's a recent new member and was really into the shows there at Red Rocks so we all talked about how cool it was to get to see Bob in such an amazing place. It was great to see Workingman's again. It's a song that it's easy to see lots of people relating to at shows. It's wonderful to be able to see fans connection to the songs they are experiencing. It brings whole new meaning to the songs. On top of that it was cool to see Levee right after it. By far the best moment of the show for me took place during When the Deal Goes Down. Rather than the usual "We learn to live and then we forgive" Bob sang "We live to live! and then we forgive". I let out the biggest yell and thought to myself, that's what it's really about. It became the theme of the tour to me! One of the highlights from the show in included the moment in Tangled when Bob says "keep on keeping on". This is a classic line for people to freak out for which we're usually relatively calm for, but this night we were both somehow programmed to randomly both freak out at that moment tonight and everyone else was pretty calm so Bob was cracking up as we were too. I was happy to see Honest with Me back too. I heard it was good from friends in Cleveland and it didn’t disappoint. I love it's driving beat that keeps the band on it's toes. I remembered to take cough drops into the show too so that really helped me enjoy the show more in some ways the second night. I hate having to worry about stifling your cough so much that it's distracting from watching the show. Seeing Tom Thumb's and Thin Man at one show was an interesting twist too! After the 2nd night at Red Rocks we hit the road pretty quickly. We got out much faster than we had the night before, and aside from my almost killing us trying to pull out onto the road, there were no major problems. Traditionally Caroline has mostly done our after show driving, but due to fact that there were mountains and much gear shifting likely involved I took the helm this night. I saw the first Ram Crossing sign of my life that night. A couple of other people making the drive said it frosted on them when they were camping. After we had almost 5 hours under our belts and the end was in sight, we came to a sign that said the road would be closed. Neither of us saw clearly what it said, but when we came to the spot there was a guy who waved us on and we were both really relieved. Shortly after that the road ended all together and we both had the same thought ‘how are they gonna get the buses over this?’ Rams, elk deer, rain and frost behind us we pulled into town. Neither of us knew where the show would be, but Caroline recalled where the park was luckily and we found a spot we could park in til 10 AM anyway. We stumbled through the park trails for awhile til we met 2 people we knew who’d skipped the 2nd Red Rocks to drive in and they led us to the spot where the lines started. We spread out our tarp and sleeping bags to try to get some rest. I wasn’t able to make it too far into dreamland due to my incessant coughing left over from a cold I picked up in Michigan so I watched as the sun came up and more and more people trickled into the park. We managed to get ourselves up for some breakfast and move the car before it was towed, but not much more that day. We found one of the only parking places in all of Telluride that didn’t have a 2 hour restriction and ended up leaving it there til after the show. One of the more impressive feats of the day was Caroline’s performance on the run into the show. In the thin air and on top of utter exhaustion she ran like the wind and got a couple good spots in the front. Behind us was a gent we’d seen at the shows at Red Rocks. I don’t think I never caught his name, but he is a total rocker, lives his life on the road seeing music and doesn’t like to stop so I call him Mr. Mojo Risin’. I haven’t seen him around before, but he was a real treat to get to hang with pre-show. There was a beautiful rainbow that developed over the field up in the mountains over the Doo-Dah and it was an early indicator of what a great show it would be. After My Morning Jacket the rain tapered off and Mojo glittered up with us and we waited for Bob to grace the stage of the little shed there in the field in Telluride. Nettie Moore was beautiful as ever. I'll never time of hearing that song and Master of War was definitely scary there in the rain. We walked out of the field with everyone else and from behind us the crowd parted not once, but twice for Bob's bus to pull out as he rounded curves in the road. Everyone in the crowd was waving and yelling thanks as he drove out. It was a fitting end to the Colorado mini-tour. After the show we found the car and drove exactly 10 MPH over to the hotel parking lot. It took us awhile to figure out where we supposed park, how to get into the building, etc. and it was good to feel a real, soft bed again and sleep a regular number of hours. After Telluride we camped in some beautiful places. I saw parts of this country I didn't have any clue about. We saw pretty much the most amazing rainbow/lightning extravaganza I can ever imagine. We drove through a microburst that almost blew us off the road, through 107 degree temperatures, and finally back home here to the fog. It was a crazy time even BEFORE we made it out to the Greater LA area and hit the OC. By the time we made it to the Newport Mesa Best Western it was again a great time to see a bed. It was a good accommodation which left us only a short walk to and from the venue. It also had a room ready for us at 11 AM, so that really sold it. Despite the clear disapproval of the people a couple rows behind us we managed to stand up and dance for a few songs after enjoying our OC priced margaritas. Maybe you saw us? Deana Carter mentioned having a hit with Lay, Lady, Lay and said she wasn’t stupid enough to play it. Usually I'd expect Bob would ignore that, but he played it. A glowing indicator of the great mood he's been of late. I love the new Blowin' in it's waving and hopeful tune. It's nice to end a show on that feeling rather than the intenseness of Watchtower sometimes. I guess the OC is a pretty light-hearted for those who have the means to enjoy it. We drove through a good dose of LA traffic and over the grapevine and headed for Paso Robles to the next stop on the 2-stop fair circuit. They really get you for as much as they can at that fair. $15 parking plus the additional price of the admission to the fair. No matter. We had resolved to have a good time anyhow with Andy and Becky near us too. We chatted with the security about the Fan Club and handed out merch. They sported Buttons and Stickers for the show so that was cool. Coming to the last day of the tour is always really sad. It was a really fun tour and I should have been able to predict that we would end the tour in a completely different way than we experienced it yet that tour and it was just as fun as any of the other times. Our tickets were in the front row, but the last seats on the left, so totally obstructed. We noticed that just behind us was a section of GA bleachers that were much better than the GA seats in the back and our seats up front so we scoped out seats there. We talked to a woman from Norway and her traveling companion from Santa Cruz for awhile before the show since there was almost 2 hours between when we got inside til the show was to start. We also met up with our friend Carol who was happy to report that she'd successfully gotten rides all over Europe from our rideboard. We were obviously really glad to hear that! Soon we spotted our friend Pam and while we were catching up we saw Ramblin' Jack standing down at the end of the bleacher section. I told Caroline to run down to the end and give him a fan club button. Without too much prodding she headed down. He took it but said ''now that wouldn't be quite fair would it..." but he waved and smiled when he headed to his seat. He's a very cool and spunky man; a lot like Bob. Soon Charter Member Jim Fox and lovely wife Steph were sitting behind us. She's due in 4 weeks now. I guarantee that everyone here will find the name choice interesting when we announce it after his/her birth. We all laughed about Ramblin Jack and then I saw Mr Mojo Risin coming down the aisle. I flagged him down and he joined us for the show. He's a riot to be near that the show whooping and hollering. Bob gave us some treats for the last day of the tour with Leopard Skin and Desolation Row taking tops awards. Another favorite is Boots which is always so beautiful and was especially magical under the Moon this night. During Ain't Talkin' everyone in our section was stomping along with Bob's singing. We headed home after sitting in the parking lot for almost an hour. Thanks for booking the last show so close to home Bob, but HOME?!?!?! NO!